A still from Prakash Neupane's Bang Bang music video. Young Nepalis are discovering a new form of artistic self-expression. One thing that the United States can be proud of importing to Nepal is its hip-hop music. In the early nineties, when the tiny Himalayan kingdom had finally started to open up to the western media and culture, Nepali youth caught the early influence of American hip-hop by mixing old Nepali songs and producing electronic DJ mixes. Nepali hip-hop — popularly known as Nephop — witnessed a gradual rise. With the end of the nineties and the dawn of the millennium, Nepal began to see the rise of proper hip-hop artists like the godfather of Nephop Girish Khatiwada and his counterpart Pranil Timalsena. The latter, however, couldn’t continue for long, unlike Khatiwada. The Girish-Pranil duo, also known as GP, though made a significant contribution to the Nepali hip-hop scene with tracks like “Yesto Chu Ma Usto Chu” and “Timi Jaha Pani Janchau.” Another group involving Sammy Samrat and Nirnaya Da’Nsk released the first English album Rappaz Union in 2000. By the mid-2000s, Nepali hip-hop industry had already seen its few experimental music and videos. However, that didn’t accumulate to its growth or significant popularity. The music genre slowly picked up its influence over the radios and FM radio stations. Its immediate influence wasn’t seen, but after 2005 many youths caught up with the music industry. Artists like Yama Buddha, Sacar, Uniq Poet, Mc Flo, Prakash Neupane, Yodda, Mahesh Dong, Keysun, Zeroo, Viber Samuel, VTEN, Professor Trix, and KTM Souljah have provided several notable tracks, which are counted as among the finest. The birth of YouTube also helped these artists to create their music and promote it worldwide. Producers like AJ the Producer, Brijesh Shrestha, and Hype have changed the hip-hop industry by creating unique beats. It is now easier for many aspiring Nepali rappers to come to the scene, but the competition is tough and not many can sustain or continue their musical aspirations by staying in the country. Unlike in the West, particularly the United States, Nepali hip-hop encounters a fractured state where artists struggle to publish their mixtapes, albums, and music videos. No labels exist in the country that would promote new artists for free and that’s a real challenge for anyone without access to money or contacts. But not all hope is gone for the industry which thrives on quirky political, social, and romantic themes. 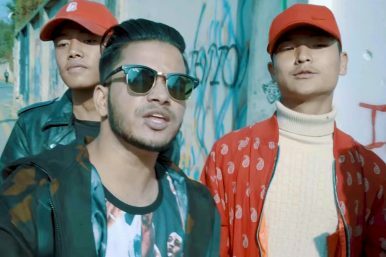 There’s no doubt that Nepali hip-hop is on the rise. The market is definitely not limited to Nepal either, as people living abroad tend to support Nepali artists and invite them for live performances. Laure tops the list for international performances. The music scene, however, is not free from tragedies and controversies. Yama Buddha, who was considered as one of the best emcees Nepal had ever produced, committed suicide in his London apartment on January 14, 2017. Another rapper known as Sakar was forced to return from Australia due to his aggressive behavior and poor mental health. The music industry is dealing with its own demons, where artists often find themselves without support and the pressure to excel puts them under immense pressure. What differentiates commercial hip-hop and underground hip-hop is the commitments and wishes of the artists — whether to push for quick economic benefits or not. If Nepal is seeing a rise of quality rappers then, on the other hand, there are those who produce low-quality music, threatening the rap scene as a whole. On a larger scale, even the producers believe there’s no instant fame or money — artists need to toil hard in order to reach the levels that every MC aspires to. There are hopeful rappers who have just begun and radiate with immense aspiration.